Adults with developmental and intellectual disabilities find camaraderie and enrichment through Step By Step’s Adult Training Facilities. By imparting employment, pre-employment and volunteering confidence and skills in a supportive environment, these programs help adults identify and cultivate their individual strengths, putting them to use in desired, right-fitting ways. Our Adult Training Facilities ensure that our clients become participants in community-specific activities. Step By Step’s Northeast Regional Day Options, known as Compass and Pathways, provides a broad range of skill-building, encouragement, and resources from 9 am to 3 pm, Monday through Friday. Visit our Day Options page to learn more about Compass and Pathways. Step By Step’s Western Regional Older Adult/Senior Center offers a creative new approach to daytime support to people age 60 and older with developmental and/or cognitive disabilities. It provides an opportunity to participate in a wide array of structured leisure activities such as creative movement, memory activities, current event discussions, gardening and plant care and arts and crafts. 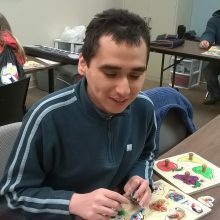 Day Options Program is a non-traditional, alternate program that focuses on the individual with intellectual disability finding valued roles in his/her community. Most of the day is spent in the community doing volunteer work, seeking employment, working on life skills, and being involved in recreational and leisure activities.